LONDON, JULY 19TH— In what were described as “guer­ril­la raids,” BBC Chan­nel 4 “strait­jack­et­ed” the stat­ues of four wide­ly admired Britons: Churchill and Flo­rence Nightin­gale in Lon­don, Charles Dar­win in Shrews­bury and Samuel John­son in Lich­field. Each fig­ure was “restrained” in a bespoke strait-jack­et which had the men­tal ill­ness they are reput­ed to have had stamped across it. 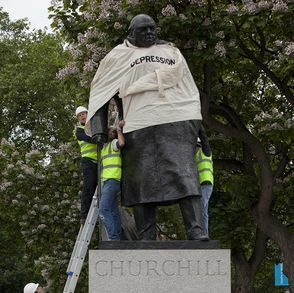 Churchill’s was labeled DEPRESSION.